After a summer filled with releases for Age of Signar it’s nice to get back to 40k, and following Death Masque we get the return of the popular Kill Team game. My first forays in the 40k universe were with games of Necromunda, I had a force of Enforcers lead by the corrupt Sargent Hill who liked to go into combat with a shield and power maul. The thing I liked about the game was that it was easy to start and quick to get on the table fully painted (though in my case quite poorly) and I enjoyed some awesome games with my Enforcers, small games in which every figure counted. Kill Team is kind of like that in that you get a small squad of 200pts, which allows you to buy, 0-2 Troops, 0-1 Elites, 0-1 Fast Attack. There are a few more selection rules, namely that you need at least four infantry models, nothing with more than 3 wounds or hull points, no vehicles with a combined AV of 33, no flyers and no 2+ saves. With a force selected using this rules, you then can play as a small band of troops doing quite cool cinematic missions lead by your heroic leader. This is a fast easy way to try 40k and may be a cool way to try out a new faction without investing a huge ton of money on a whole army only to find out you dislike it. The rules have been released on Black Library, fully updated for 7th edition for the low price of £6.99 as an ePub, or if you bought the 6th edition version, it’s a free update. For those on iOS there is also an enhanced version for £7.99. 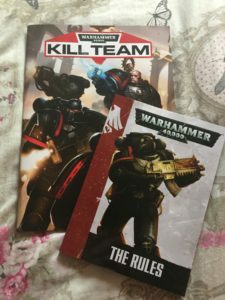 The box set I am reviewing comes with these rules in a handy booklet, and you get a an excellent two player set which also includes a full copy of the 40k rules with a Raven Guard cover, along with a set of Space Marines Tactical Squad and a set of Tau Fire Warriors, and you get all of that for £40. And that is excellent value, its about the price of a decent board game these days and is perfect for starting out with 40k and you don’t fancy the Dark Angels or Chaos Space Marines offered in the Dark Vengeance box. The only things you don’t get are dice or templates, but in fairness these are easily acquired elsewhere. So getting back to the game, when you build your army there is one thing you should bear in mind, and that is that when you add dudes to your team, although they may act as individuals in the game, you still buy them as a unit, so if you only want say 4 Space Marines, you still pay the price for 5 of them, so mixing and matching units can get quite hard. The model with the highest leadership becomes your team leader and gets what is in effect a mini Warlord trait, which is chosen exactly the same way, by rolling a D6. You can then nominate three non-vehicle models to be specialists, and you can pick from one of five categories, Combat (melee orientated), Weapon (shooting orientated), Dirty Fighter (dirty tricks), Indomitable (making the model a bit special), or Guerrilla (movement orientated). When you pick your specialist you then get to given them a special rule from the category, for example in the Raven Guard kill team data sheet included in the rule book, a model armed with a Missile Launcher, is an Indomitable Specialist and gets the Relentless Special Rule, meaning he can fire that Missile Launcher on the move. Now you only get one of each speciality so no giving yourself multiple versions of the same specialist. The book also contains six special Kill Team missions which are played on a 4’x4′ board. The missions do have slightly different rules to standard games, for example, transports can carry multiple units, because each model is a unit all of its own. And some codexs get a tweak too, for example, Chaos Daemons don’t use the Warp Storm or Daemonic Instability rules, but they do get fearless instead. There is a nice mix of mission in there, objective missions, assassination missions, get into your opponents deployment zone, but they are all quite fun and short in length, so you can easily play a couple of games in a single session. 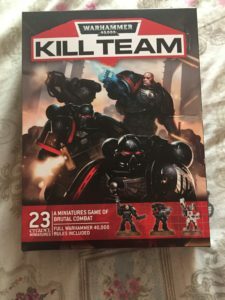 The book then looks at what the next steps in Kill Team could be, for example it suggests tournaments, linked games, and multiplayer games. 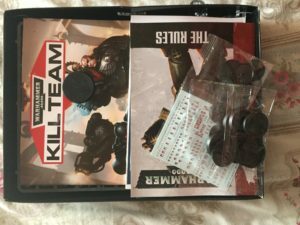 So you can see Kill Team offers plenty of scope beyond whats in the box. 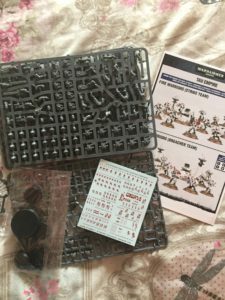 Finally the book contains Data Sheets fro two pre-built Kill Teams built from the kits in the box, one a Raven Guard squad, and the other, a team of Tau Fire Warriors complete with Drones. 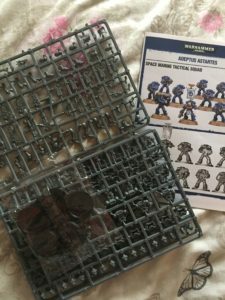 This is a cool template to use, but does somewhat take away from the fun of building your own Kill Team, but for people new to 40k, they are perfect. Its a great game, just be wary of who you play with!